And in particular, for Mitt - who really has been demonized in many ways as being heartless and for people to stand up and say, ‘Excuse me. He was there when my son was dying of leukemia. He came to my son's bedside. He did all of these things for my son.' And then another woman saying how Mitt was there for her. So there's hundreds of those stories that haven't been told. And it was refreshing to me for the American people to finally be able to see the lens through which I see my husband and the perspective in which I understand how he operates. And our struggles have not been financial, but they've been with health and with difficulties in different things in life. And one thing that I, again, like to remind people is that - multiple sclerosis has been my teacher. It has been at times a cruel teacher. But it has also been a great gift in my life because [of] what it has done, it has taught me to be more compassionate and caring for others that are suffering. 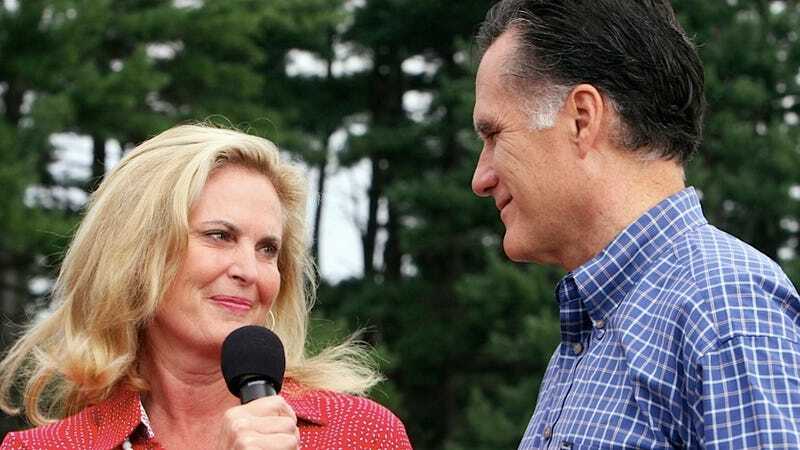 Aside from that final macabre window opening into Ann Romney's soul, it's hard to say how successful casting Mitt Romney as the compassionate candidate will be. And by how successful I of course mean whether the strategy will have no impact at all, or whether it will seem so patronizing to some people that it may actually work against Mittens, because if there's one thing anyone with money trouble hates hearing from rich people its insincere commiseration. Still, if South Park has been any sort of barometer on Mormonism, the Romneys are probably right this very minute sitting down to an alarmingly good-humored game of Monopoly, thinking innocent thoughts about the platypus god waiting to greet them in heaven, unaware that anyone in the world bears them even the slightest ill-will.